Posted on July 28, 2015 by Matt Frazier / This entry was posted in Informative. Bookmark the permalink. American cannabis is a hot topic in the news today. But cannabis has been used as medicine since ancient times, as described in Chinese, Indian and Roman texts. Today, American cannabis is widely grown, and used since just after the British arrived. With its roots in hemp growing and manufacturing, American cannabis history tells quite a unique tale. Soon after the Civil War, the cannabis plant became heavily depended on by surviving soldiers as a coping mechanism for the heavy opiates used during hospital stays for the injured. Going largely unnoticed by the majority of Americans at the time, tales of marijuana use in the Orient, helped spark a cannabis fad among small pockets of intellectuals in the mid-19th century. These pockets grew and spread through the 1920s and became especially popular with jazz musicians. Louis Armstrong, even urged it’s legalization in a letter to President Dwight Eisenhower. At this point many Americans became familiar with its growing usage through the false hysteria created through top propaganda films— most famously, “Reefer Madness,” which depicted young adults turning to violence and even becoming insane after smoking marijuana. The movie found little audience upon its release in 1936 but was rediscovered by pot fans in the 1970s. Congress banned marijuana in 1937. Continuing the campaign into the ’40s and ’50s, lawmakers even tried to get jazz musicians to inform each other and their listening public of the hazards of smoking cannabis, obviously to no avail. Hemp for Victory is a critical moment in American cannabis history. 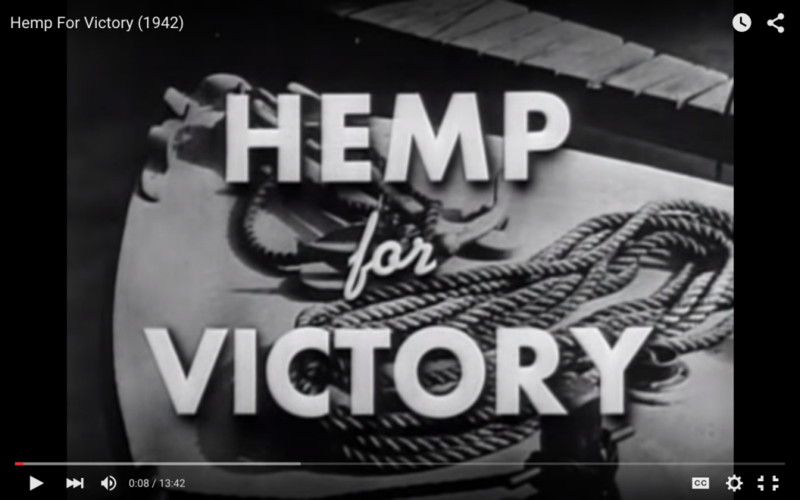 However during WWII the department of agriculture changed its tune about growing and manufacturing the cannabis plant as hemp, when it released “Hemp For Victory,” a propaganda film urging farmers to grow hemp for its use in supplying parachutes and rope for the war effort, after trade was cut to Japan where many of our rope fibers where imported from. At this time in history growing hemp within the states became a necessity. However, as conformity in the postwar era took hold, getting high on marijuana and other drugs became a symbol of the counterculture, with Jack Kerouac and the rest of the Beat Generation singing pot’s praises. It also continued to be popular with actors and musicians. Congress responded to increasing marijuana use with stiffer penalties in the ’50s. Beginning the hype of what we now call the “gateway drug” theory: that marijuana had to be controlled because it would eventually lead its users to harder substances. Then came Vietnam. The widespread, open use of marijuana by hippies and war protesters from San Francisco to Woodstock finally exposed the false claims so many politicians and religious leaders had made about marijuana leading to violence. In the 1960’s and 70s, many states passed laws calling for American cannabis studies regarding efficacy as medicine, although virtually no studies ever took place because of the federal prohibition. In recent years, medical marijuana dispensaries have appeared in many states, including Washington, Colorado and California. That’s prompted some to suggest they are fronts for illicit drug dealing and that most of the people they serve aren’t really sick. The Justice Department has shut down some it deems the worst offenders. States are working to set up regulations with licensed growers, processors and retail stores. Despite federal level backlash, eventually we feel adults in every state will be able to walk into a store, buy some marijuana, and walk out with ganja in hand — but of course, not before paying the taxes, which would raise hundreds of millions of dollars for schools and other government functions. At this pinnacle in the movement, the future of legalization across the board looks not only possible but probable. In the near future we can look forward to the decriminalization and true understanding of this widely misinterpreted and illustrious plant.